Cherries are the joy of July. We bought two boxes of plump, bright Spanish cherries from one of the wholesale fruit sellers in Dublin’s old Smithfield fruit market off Capel Street. Walking home through the city with our boxes of cherries, we day dreamed about the sweet and savoury plans we had for our bounty, eating a good few handfuls of them before we made it back to our kitchen. Semifreddo has a frothy texture sort of like a frozen mousse. This is a time consuming recipe (it needs to be frozen over night) but it isn’t difficult and the results are entirely worth the effort. Wash, halve and stone your cherries. This takes a bit of time but there’s nothing like a chat over a bowl of pitted cherries so make sure you rope in a friend to do it with you. Set aside 50g of cherries and put the rest in a large saucepan. Pour in the cream and add 50g of the icing sugar. Bring to a boil and then gently simmer for 5 minutes. Use a hand-held blender to blitz the cherry cream until very smooth. Pass the mixture through a sieve, discarding the leftover pulp. Put the cherry cream back into the saucepan over a low heat. Separate your eggs, with your yolks in one bowl and whites in another (very clean) bowl. Pour a little of the hot cherry cream over the egg yolks and whisk well before pouring the egg yolks into the cherry cream in the saucepan. Add the almond extract, whisk well and then gently simmer for another 5 minutes, until the cream has thickened and will coat the back of a wooden spoon. Pour the cream through a sieve again and then set aside to cool completely. When the cherry cream has cooled completely, add the chocolate chunks. Now, using an electric whisk, beat your egg whites until they form stiff peaks. Whisk the other 50g of the icing sugar into the egg whites, one tablespoon at a time, until the mixture looks like shaving foam. Stir a third of the egg whites into the cream mixture, folding gently so as not to let the air out of the egg whites. In two more batches, add the rest of the egg whites to the cream and fold until everything is well combined. Line a 900g loaf tin with cling film and pour the mixture into the tin. Cover it with clingfilm and put into the freezer for 3 hours. Take it out and stir the remaining 50g of cherries into the semifrozen mixture before returning to the freezer for an overnight rest of at least 8 hours. 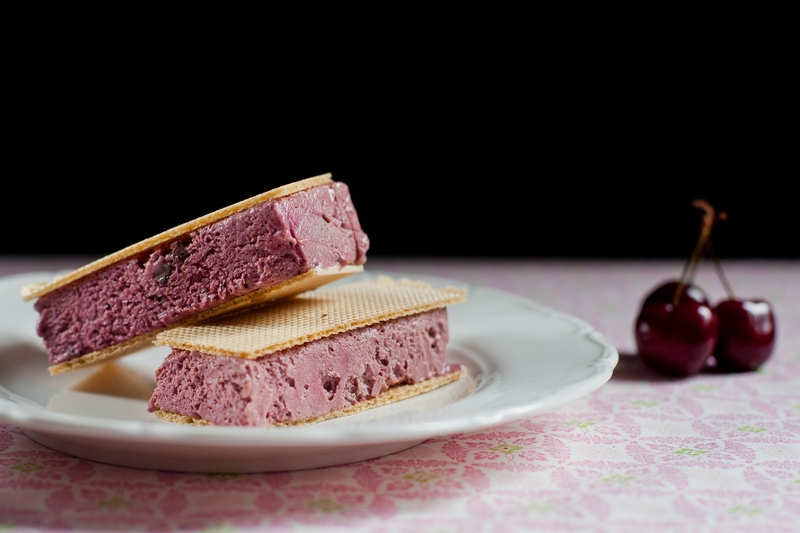 Serve your cherry & chocolate semifreddo cut into slices and sandwiched between wafers. This recipe first appeared in Insider Magazine in The Irish Independent on July 10th. Beautiful recipes. The colours are so vibrant also. Happy to have the cherries and black pudding back on our menu also.